Your trusted counsel for defective medical device litigation in Washington, D.C. When you cut yourself, your blood clots to stop the bleeding; it is your body’s natural response. In some cases, however, a blood clot can form within your veins and travel to various parts of your body, putting you at risk of a serious medical condition. Blood thinners are often prescribed to stop the problem, but when they fail – or if a person cannot take the drug – the doctor may implant a filter that is designed to “catch” the clots before they travel to your heart or lungs. Inferior vena cava filters, or IVC filters, are placed in the vena cava to do just that. When they fail, however, they can lead to devastating consequences. The defective medical device attorneys of Paulson & Nace, PLLC, understand the risks that IVC filters pose. Our team represents victims in Washington, D.C. who were given incorrect or incomplete information about these dangers, and who were harmed by defective IVC filters. For the last 40 years, we have put our skills and experience to work on behalf of families throughout the area, ensuring that justice is served, and helping our clients obtain the compensation they need after they were harmed by a defective product. In essence, not only might the device fail to operate as expected, but it could also travel or break into pieces inside a patient. The FDA recommended that doctors warn their patients about the potential risks, and they remove the filter as soon as possible once a patient no longer needed it. In July of 2015, the FDA issued a letter to C.R. Bard, the manufacturers of multiple IVC filter lines and removal kits. The gist of the letter claims that the company is marketing their products without proper clearances, “that the methods used in, or the facilities or controls used for, their manufacture, packing, storage, or installation are not in conformity with the current good manufacturing practice requirements of the Quality System regulation,” and that they fail “to establish and maintain procedures for receiving, reviewing, and evaluating complaints” at various centers. In September of 2015, NBC News reported that a link may have been found between C.R. Bard’s Recovery line and the death of 27 people, and that the government’s data revealed about 300 “other non-fatal problems” with that particular line. The report includes the story of a woman whose heart was pierced by an IVC filter fragment, which necessitate emergency heart surgery, and the tragic tale of a woman who died after a blood clot pushed the entire device into her heart. Despite the complaints and concerns raised, NBC News reports that C.R. Bard continued to sell that specific Recovery IVF filter for three years before replacing it with a new model. Approximately 34,000 of them were sold to medical facilities throughout the country. At Paulson & Nace, we do not stand for this type of injustice. That is why so many people in Washington, D.C. work with a defective medical device lawyer from our team when they have been hurt or duped by large pharmaceutical companies like C.R. Bard. We have the drive and passion to stand up to Big Pharma when their products leave a wake of death and destruction behind them. Our firm has the resources to handle complex products liability cases, and we do not stop fighting until we know our clients are safe and justice has been served. 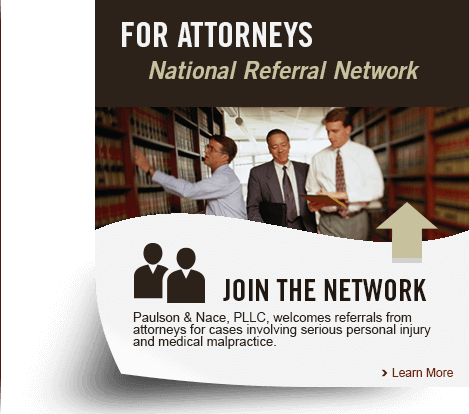 At Paulson & Nace, PLLC, we know what it takes to build a successful products liability lawsuit against C.R. Bard and manufacturers like them. We want to help you protect your family. Please call 202-930-0292 or fill out our contact form to speak with a dedicated defective medical device attorney in Washington, D.C.